Lennon-Art is a bright and colourful gallery in Stockbridge, Edinburgh, founded earlier this year by the artist Alan Lennon, to showcase his own multi-media work, alongside contemporary figurative paintings by selected artists. 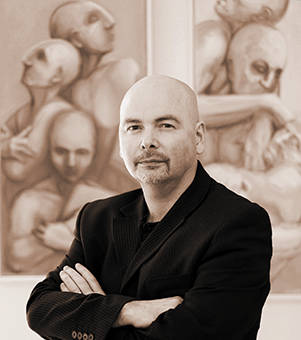 A new exhibition Common Ground (17 November to 3 December, 2017) is a collaboration between Alan Lennon and Michael Cook who share a strong artistic bond through similar ideas and themes, specialising in symbolic figures set in imaginative environments. The narrative behind Common Ground focuses on spirituality, religious faith and the wider aspect of the human condition, the characteristics and essence of existence – birth, growth, emotion, aspiration, conflict and mortality. On the opening night, Richard Holloway, the writer, broadcaster and former Bishop of Edinburgh gave a most profound speech on the topic of philosophical belief. Unlike the animal world, it is only the human race with the intellect to question the meaning of life, the reason for so much suffering and sorrow. 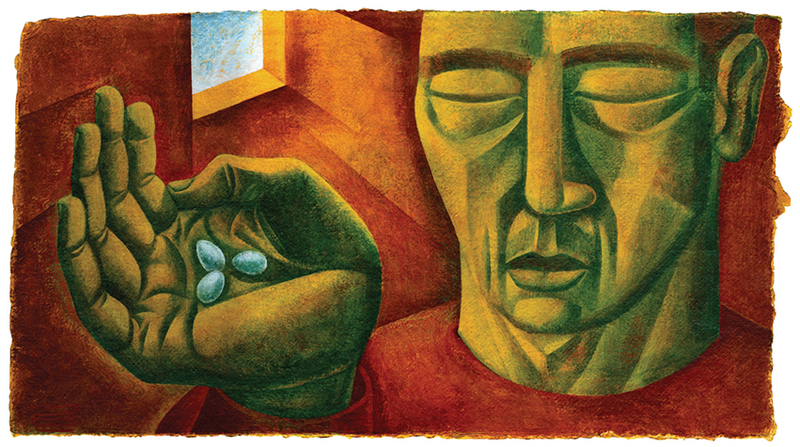 It is has long been the role of artists, musicians and writers to express their own views on this elusive subject. Gerard Manley Hopkins used poetry to describe his religious faith using symbolic images of birds, trees and natural world. He advises gallery visitors to view the art with a fresh eye, without having to rely on the given title – let the images, mood, sensibility relate to you personally what the artist is trying to communicate. 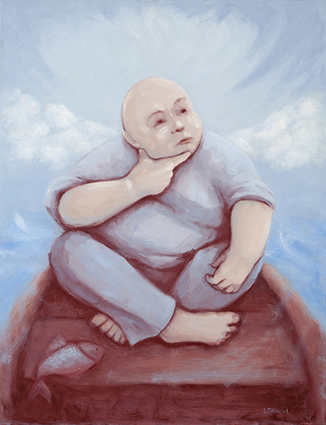 Alan Lennon’s paintings explore the human form with a recurring theme of isolated figures, often surrounded by the open sea, with facial expressions which depict deep contemplation and thought. 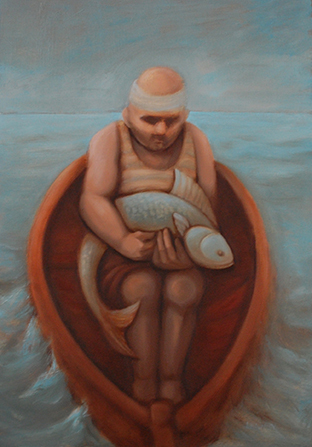 In works such as “Adrift” and “Fish out of Water”, there is an unsettling sense of loneliness, despair and vulnerability. But, of course, you can find your own hidden meaning in these soulful compositions. 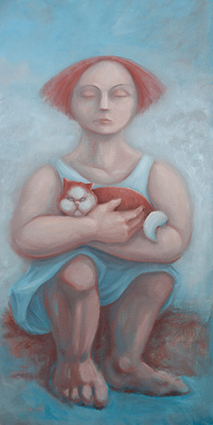 A more humorous, quirky portrait is of a red haired girl, sitting (perhaps) on a seashore rock, where, in her arms she cuddles a cute, fat cat. The title is “Hear What I am Not Saying” whether this refers to a silent prayer to God, or trying to converse with her cat. Enigmatic yes, but such a poignant image. 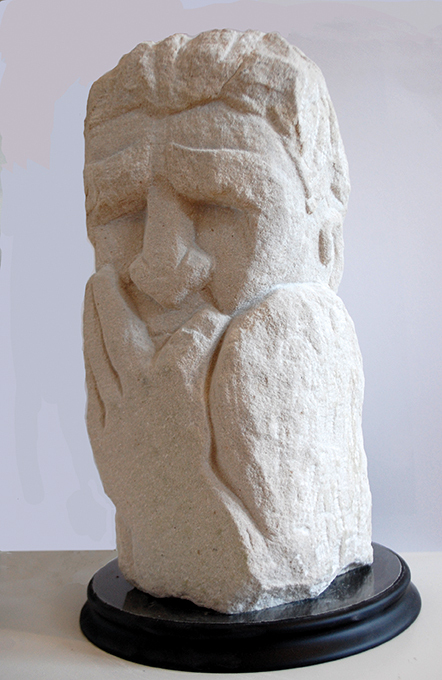 Alan is also a most accomplished sculptor working with both clay and stone to create meticulously carved Heads and Busts. Reminiscent of Rodin’s “The Thinker,” one stunning piece, “Regret” is of a man covering his mouth with his hand, as if he cannot dare to speak, in a state of mental torment. 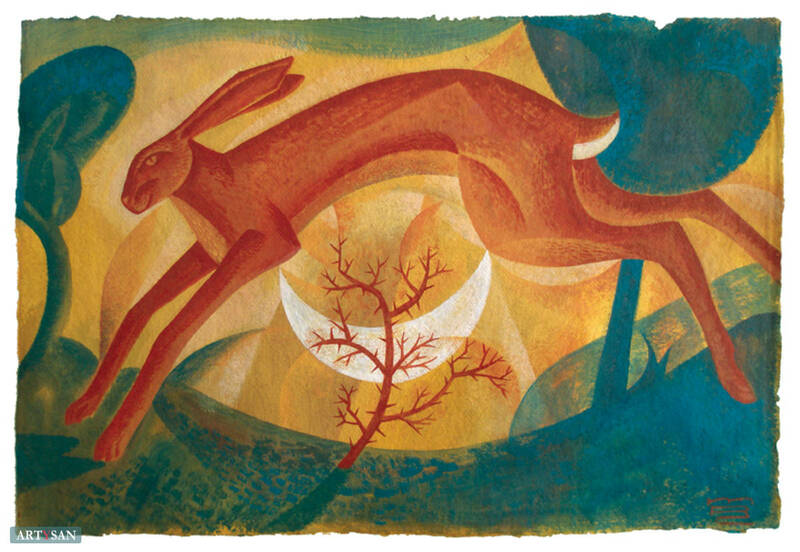 Michael Cook lives and works in Melbourne, Derbyshire, inspired since childhood by the countryside of fields and orchards, flora and fauna. 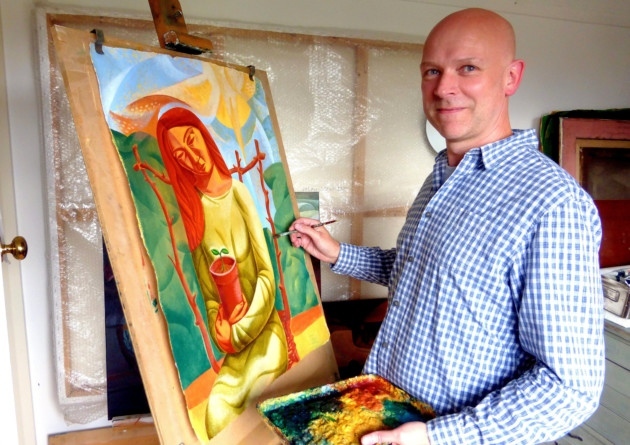 Following the Romantic and Visionary tradition, his artwork represents feelings of joy and loss, as well as capturing the power of religious devotion. 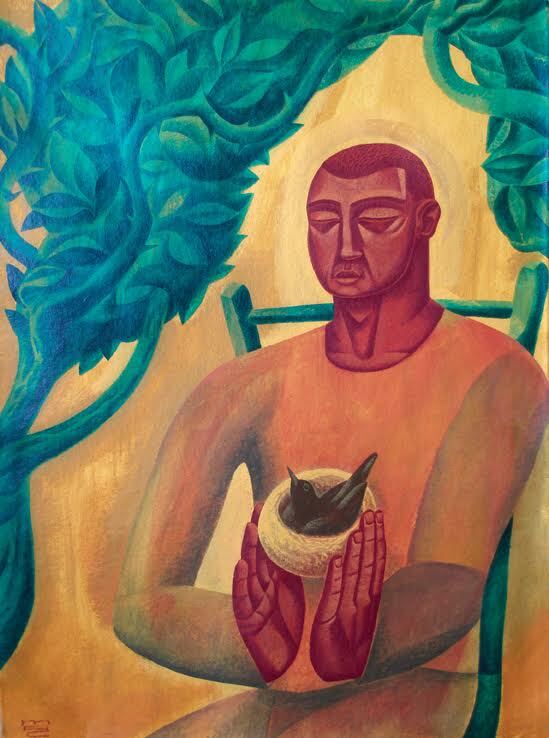 In a striking portrait, “Hand Like a Nest,” the curved bowl-like hand of Saint Kevin gives sanctuary for three tiny blackbird’s eggs; his head is portrayed in sharp, chiselled Cubist style, the eyes shut in peaceful repose with a kindly expression. Behind, soft light shines through the window comparing the interior confinement of the room and the distant outdoor world. 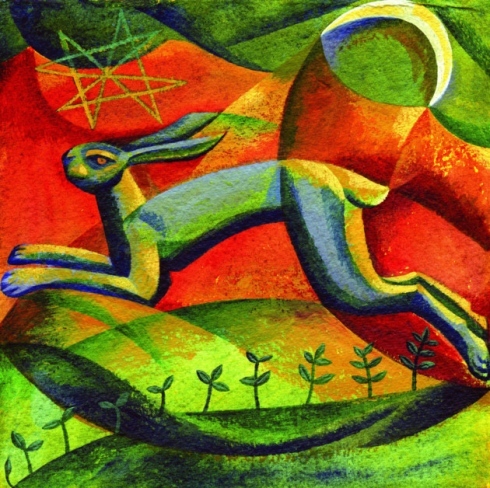 Like charming children’s book illustrations, Cook also specialises in animals such as carefree hares racing across a flourishing green meadow, against a backdrop of trees, sun and moon. This well curated exhibition clearly shows how Lennon and Cook’s work complement each other so beautifully. Around the gallery their joint theme an underlying sense of kindness and compassion, an aura of silence, private visions of anguish and indecision, trying to find the right path on the journey through life. At this time of year, as we head towards Christmas and the birth of the New Year, these gentle, solitary figures amidst calm, dreamlike, landscapes illustrate the meaning and importance of peace and goodwill to all mankind. Thought-provoking narrative art with real emotional heart. 17 November to 3 December, 2017 – Mon-Sat, 11am – 6pm. Sun 1 – 4pm. Original art, paintings, sculpture, photo-montage prints and cards. Autunn Shadows in the Meadows. At the Dundas Street Gallery this week, take a painterly, virtual reality tour around Edinburgh to view the classic architecture of the Old and New Towns, climb Arthur’s Seat, stroll through the tree-lined Meadows and down to the waterfront at Leith. Since 2003, I have followed Jamie Primrose’s own artistic journey, from Scotland to South America and the Mediterranean, as he has perfected a bold style and precise palette to create his own dramatic, moody, impressionistic landscapes: during the summer, he showcased a masterly exhibition of shimmering seascapes along the French and Italian Rivieras. This fine new collection of work reflects the natural beauty and architectural heritage of Edinburgh as seen through the seasons. The Meadows are captured from flowering pink blossom in Spring to the bare, skeletal avenue of trees in winter, but whatever the time of year, the scenes are enriched with realistic shafts of light and shadow. It is quite extraordinary how he can return again and again to the same or similar city views where, through different times of day and the year, he observes the scene with a distinctively fresh perspective. This reveals the personal passion for his home, the city of Edinburgh. Queen Victoria made her first visit to Scotland in 1842, just five years after becoming Queen. She noted this description in her journal at the time, marvelling at the beautiful views of the Castle, Calton Hill and Arthur’s Seat. 175 years later Jamie Primrose is equally inspired by the same enchanting cityscapes with its timeless, majestic sense of place. In the introduction he says he is “fascinated by the ephemeral nature of light” and here you can experience the shifting times of day from dawn to dusk. Taking prominence on one wall is “ Spring Sunset from Arthur’s Seat, ” a marvellous panorama of the grassy hilltop and craggy rocks beneath a sultry, serene sky. Very much his recurring forte are these fiery sunsets – wild streaks of coral-pink and grey tinted cloudy skies with a rosy glow bursting on the horizon. Arthur’s Seat is a favourite stomping ground for Primrose – here too are tranquil scenes of Duddingston Loch as well as “Late Afternoon glow over Dunsapie Loch,” looking across the distant bay towards East Lothian. “Winter sunset reflections on St. Margaret’s Loch,” is also a calm composition where the water dapples under soft, fading light and a streak of feathery clouds. So atmospheric, you can almost feel the chill wind in the air. Back in the city centre, enjoy a walk up and down Victoria Street between George IV Bridge and the Grassmarket: colourful, curving and cobbled, the street is a tourist attraction for antiques, books, cheese, whisky, tailored tweed clothing, the Bow Bar and restaurants. Primrose shows Victoria Street in the quiet darkness of night to depict the quirky row of shops under a sweeping mauve sky. Around the Old Town, there are fine architectural studies around the Royal Mile, the iconic skyline of elegant church spires and the Castle towering high on the Rock. A fairy-like city indeed – Queen Victoria would surely be impressed!. Private Commissions are also welcome – perhaps a favourite landscape or your own street. Limited Edition Prints (destinations from Scotland to Venice), and Black Indian Ink Drawings are available too – the ideal Christmas present for family, friends or your home. Serene Expressions – Friday 3rd to Saturday 11th November, 2017.